This route is strenuous to protect on lead and is much more appealing as a toprope. 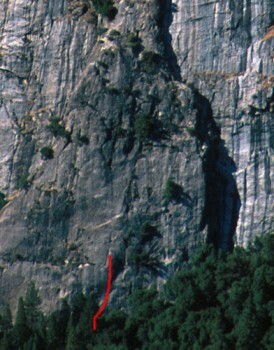 Set a toprope by swinging left on a double-rope rappel from the Pitch 2 anchors on Jamcrack. It is difficult to reach from the Pitch 1 anchors. The route continues half a pitch, but is very dirty with bad bolts and seldom done. Which SuperTopo guidebooks include a topo for Lemon? Jamcrack is the line in the right. Lazy Bum the line on the center. Bummer the line on the left.